Exhibition at Bait Al Serkal, Sharjah, UAE, 13 March - 13 June 2014. Essay about her work, on the spaces we seek and the places we make to be able to face others, and ourselves. If we were forced to be in one place, and one place only, we would go mad. If I were confined to one self, and one self only, I would fall apart. Nostalgia, imagined worlds, virtual realities, dreams, screens, and shadows are ways of putting myself out of harm's way, routes of escape that keep us alive, keep me going. Susan Hefuna’s photographs, sculptures and drawings offer a physical analogue to this mental structure: an experience of the patterns and grids we construct to navigate our inner and outer worlds, of the spaces we seek and the places we make to be able to face others, and ourselves. "Another Place" is both an invitation to explore those cultural routes of escape, and a highly personal journey tracing experiences for which there may never be words. 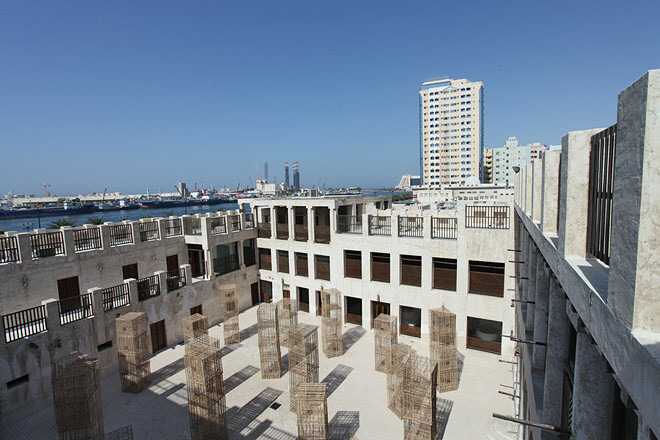 Bait Al Serkal is a wonderfully evocative exhibition space for Hefuna’s multi-faceted art. This large 19th century complex — built around a courtyard and featuring airy, light filled galleries — used to be the residence of the British Commissioner for the Arabian Gulf, which in the 1960s was converted into the first hospital in Sharjah. What better place to address, explore and experience questions of power, cultural difference, memory, the relationship between public and private, trauma and the work of mourning and healing. Susan Hefuna is an artist who works between cultures and languages, between times and spaces, between knowing and not-knowing — questions that in our globalized world all too often crystallize into the false opposition 'the Orient' vs 'the West'. Sensitive to the ghosts of place, Hefuna's work draws attention to the precarious presence of the foreigner, the outsider, (the one who is unknown and doesn't know) and the ways in which we engage with him or her: thresholds, screens, and veils are important features of Hefuna's art. Take the mashrabiyas: In their interplay of light and shadow the mashrabiyas offer a transitional experience, a negotiation between inside and outside, public and private, me and you, past and present. As light falls through the screen, composing delicate ornaments on the floor, I realize, How fragile we are! Like a second skin the mashrabiyas protects what is often most endangered in the encounter with the other: the recognition of the differences that unite us. Mashrabiya: a shutter that doesn't expose. And then there are the drawings. They draw me in, literally. Ink and pencil on multiple layers of tracing paper, Hefuna's drawings work with abstract patterns and configurations. They evoke molecular structures, maps, cityscapes, the intricate patterns of the mashrabiya, embroidery and tapestry but also musical scores, dance notation, a choreography of dots, lines and curves. The structures we invent to assure ourselves that we're good, that we have nothing to fear. And danger there is. What could be more prone to injury than pencil, ink and tracing paper? With each layer covering for the other the drawings speak to our vulnerability. Our need to hide, and my deepest wish to be found. So I leave traces. No one wants to die upon the surface. Though abstract and formal, the drawings contain the body. Produced with one spontaneous uninterrupted movement of the hand, the lines, curves and dots describe an unpredictable journey. They move towards the future but they come from the past, from that impossible place in ourselves that motivates my very step. Yes, there's more than one body here — or rather, this body is in more than one place at once. As one layer of tracing paper shelters the other, making space and taking place for one another, I become aware of the space between. The superimposed layers of translucent paper create an indefinable space: firm yet shifting, wounded yet protected, strange yet intimate. I know this place. When I look at the drawings, I see trauma. Marks of an unspeakable pain that happened in the past and makes itself felt in the present. When we realize that once we're broken nothing mends. There are no words yet. You are … in me but not part of me. There and not there. Here and gone. Held in suspension. In their fragile beauty — some of the drawings are literally harmed, pierced, perforated, bleeding, stitched together — the drawings are at once terrifying and hugely attractive. Terrifying in that they don’t conceal the wound that lives within them (a wound every foreigner knows); attractive because they draw strength and orientation from tracing their pain and vulnerability. Although highly seductive, there is nothing dramatic about Hefuna’s drawings. The two layers invite me to embark on a journey. It is the viewer who gives direction, bestows a sense of purpose onto the patterns and grids; it is me who decides what to foreground and what to push back. I think of the drawings as a "corporeal map" (a concept hard to grasp within Western notions of rational space), as a way of relating to a place, a city, a body, a history, that combines the experiential — always corporeal, always sensual — with the abstract, without ever subjugating one to the other. The fleeting presence of Hefuna’s drawings… they remind me of Italo Calvino’s Invisible Cities. It is the escape route of our imagination that keeps us sane. For when the boundaries collapse, when the safety of that other place can't be maintained, when past and present suddenly converge — we fall apart. Broken lines. Shattered worlds. Fragmentation. Is this where the impulse to make art comes from? To make sure that there will always be Another Place? Traces of you? Writer, culture critic and psychotherapist in training. Professor at the School of Visual Arts (SVA), New York, USA. The Contemporary Drawing Prize 2013 of the Guerlain Art Foundation was awarded to Susan Hefuna. The artist led a two-day public event of debate and exchange at Hyde Park Speakers’ Corner, London. Patience is Beautiful: Multi-layered drawings with embroidery, and mashrabiya screens with texts. Sharjah, UAE. Symposium conceived by curator Eungie Joo as part of the Sharjah Biennial 2015. Photos of the Meeting and the parallel SAF exhibitions.